R.S. Chapman, Language and Communication in Individuals with Down Syndrome. C. Mervis, M.L. Rowe, A.M. Becerra, and B.P. Klein-Tasman, Language Abilities of Individuals with Williams Syndrome. L. Abbeduto and M.M. Pavetto, Language and Communication in Fragile X Syndrome: Within-Syndrome Commonalities and Differences. T.E. Coggins, L.B. Olswang, H.C. Olson, and G.R. Timler, On Becoming Socially Competent Communicators: The Challenge for Children with Fetal Alcohol Exposure. E.C. Merrill, R. Lookadoo, and S. Rilea, Memory, Language Comprehension, and Mental Retardation. F.A. Conners, Reading Skills and Cognitive Abilities of Individuals with Mental Retardation. N. Brady, Language Interventions for Children with Mental Retardation. Language and communication problems have long figured prominently in the definition of mental retardation. 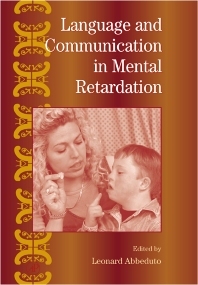 Volume 27 of the International Review of Research in Mental Retardation focuses exclusively on these language and communication issues. The pace of research on language learning and use in mental retardation has increased in recent years and taken new direction. This revitalization has been fueled by three factors: 1) advances in genetic technologies allowing investigation of the behavioral phenotypes of well-defined syndromes, 2) an increased emphasis on maximizing abilities of individuals with mental retardation to live and succeed in a broader range of contexts and settings, and 3) theoretical debates concerning the mechanisms of language development and the nature of the human mind. Contents in Language and Communication in Mental Retardation include syndromes (e.g., Down syndrome, Williams syndrome), domains of language skill (e.g., reading), and intervention strategies.